6 December 1959: Project Top Flight. 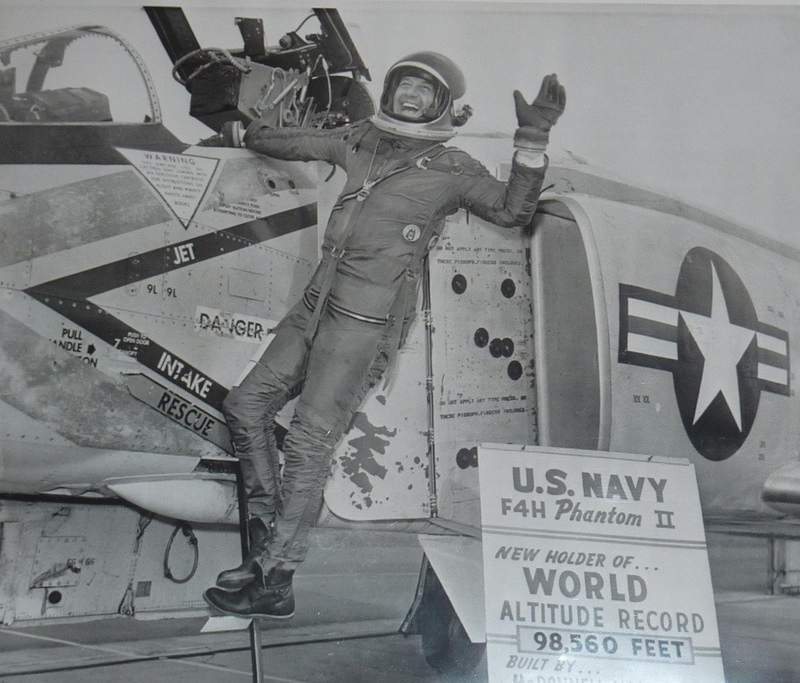 At Edwards Air Force Base, California, Commander Lawrence Earl Flint, Jr., United States Navy, set a Fédération Aéronautique Internationale (FAI) World Record for Altitude with McDonnell YF4H-1 Phantom II, Bu. No. 142260. At 47,000 feet (14,326 meters), Commander Flint accelerated in level flight with afterburner to Mach 2.5, then pulled up into a 45° climb and continued to 90,000 feet (27,432 meters). He had to shut down the Phantom’s two General Electric J79 jet engines to prevent them from overheating in the thin atmosphere. He continued on a ballistic trajectory to 30,040 meters (98,556 feet). This was just short of the arbitrary 100,000 feet (30,480 meters) that delineated the beginning of space at the time. Diving back through 70,000 feet (21,336 meters), Flint restarted the engines and flew back to Edwards. 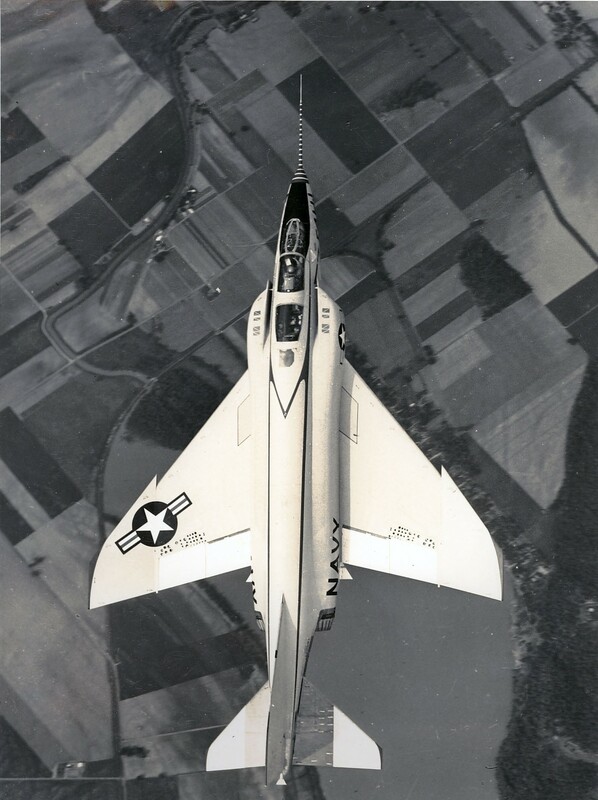 McDonnell Aircraft Corporation test pilot Gerald (“Zeke”) Huelsbeck had been conducting test flights to determine the best profile for the record attempt. Commander Flint flew twelve zoom climbs between October and December, five times climbing past 95,000 feet (28,956 meters), but not exceeding the previous record, 28,852 meters, set by Vladimir Sergeyevich Ilyushin ² with a Sukhoi T 431 (a modified Su-9 interceptor), 14 July 1959, by the FAI-required 3% margin. During the first week of December, with National Aeronautic Association personnel at Edwards to monitor and certify the record for the FAI, he flew three flights each day. 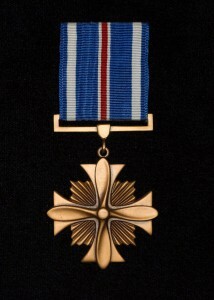 Commander Flint was awarded the Distinguished Flying Cross for this flight. Lawrence Earl Flint, Jr., was born at Sophia, West Virginia, 24 June 1920. He was the first of three children of Lawrence Earl Flint, a salesman, and Rosetta M. Richmond Flint. 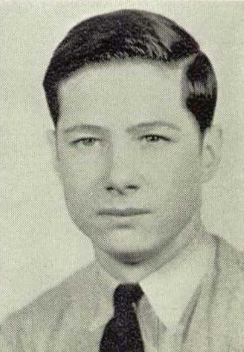 He attended Woodrow Wilson High School at Beckley, West Virginia, graduating in 1938. He then attended Beckley College (now, Mountain State University), and Emory & Henry College at Emory, Virginia. Flint entered the United States Navy as an aviation cadet under the V-5 Program, 30 July 1940. He was trained as a pilot at NAS Pensacola and NAS Jacksonville. He was commissioned as an Ensign, United States Naval Reserve, 10 October 1941, and designated a Naval Aviator, 5 December 1941, two days before the Imperial Japanese Navy attacked the U.S. fleet at Pearl Harbor, Hawaiian Islands. Ensign Flint was assigned to Scouting Squadron Two (VS-2), flying the Douglas SBD-3 Dauntless dive bomber. He was promoted to Lieutenant, Junior Grade (j.g. ), 1 October 1942. 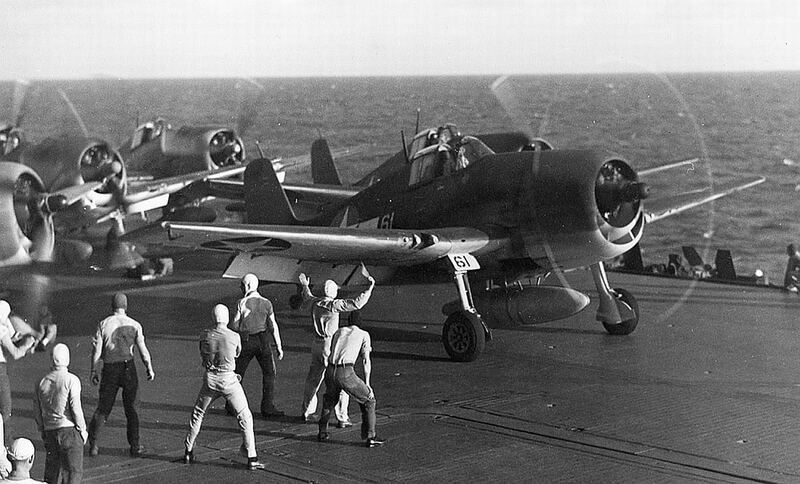 In 1943 he transitioned to the Grumman F6F-5 Hellcat fighter with Fighting Squadron Eighteen (VF-18) aboard USS Bunker Hill (CV-18). Flint was promoted to Lieutenant (Temporary), 1 October 1943. This rank was made permanent on 30 October 1944. In 1944, Lieutenant Flint was assigned to Flight Test and NAS Patuxent River, Maryland, flying the earliest American jet aircraft. 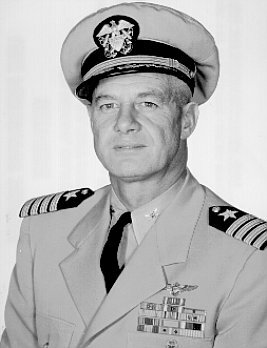 Flint was promoted to Lieutenant Commander, United States Navy, 3 October 1945. Lieutenant Commander Flint then attended the U.S. Navy General Line School at Newport, Rhode Island. In 1947, Flint went to Attack Squadron Fourteen (VA-14, “Tophatters) as the squadron’s executive officer. VA-14 flew the Chance Vought F4U-4 Corsair. In 1949, Lieutenant Commander Flint married Miss Betty Alice Noble of Salt Lake City, Utah. Mrs. Flint had served in the United States Navy during World War II. After a staff assignment in the Office of the Chief of Naval Operations, in 1951, Lieutenant Commander Flint was sent to the Empire Test Pilot School at Boscombe Down, Wiltshire, England. 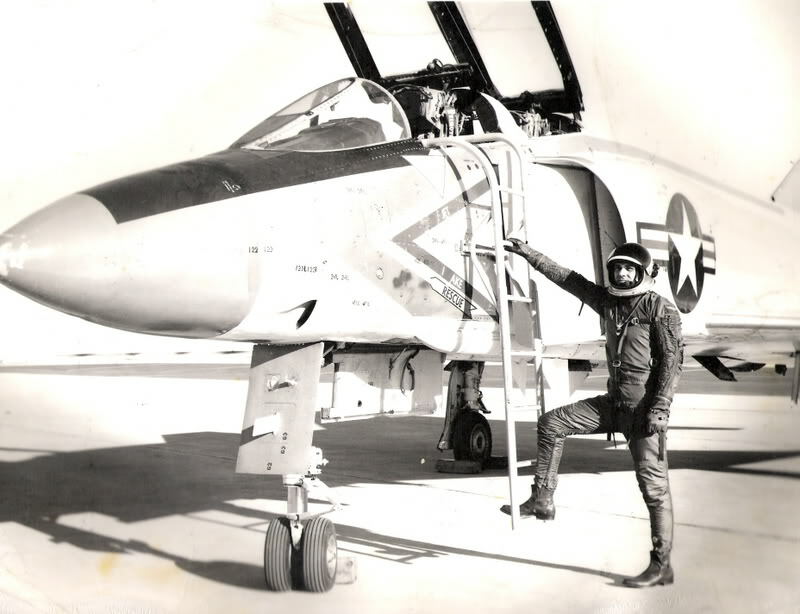 Flint returned to combat operations during the Korean War, as executive officer, and then commanding officer, of Fighter Squadron Eleven (VF-11, “Red Rippers”), flying the McDonnell F2H-2 Banshee from USS Kearsarge (CVA-33 ). Following the Korean War, Flint was assigned as Assistant Experimental Officer at the Naval Ordnance Test Station, China Lake, California, and then went back to sea as Air Operations Officer on board USS Lake Champlain (CVA-39 ). He was promoted to Commander, 1 January 1954. From 1957 to 1959, Commander Flint was once again in flight test operations at NATC Patuxent River. 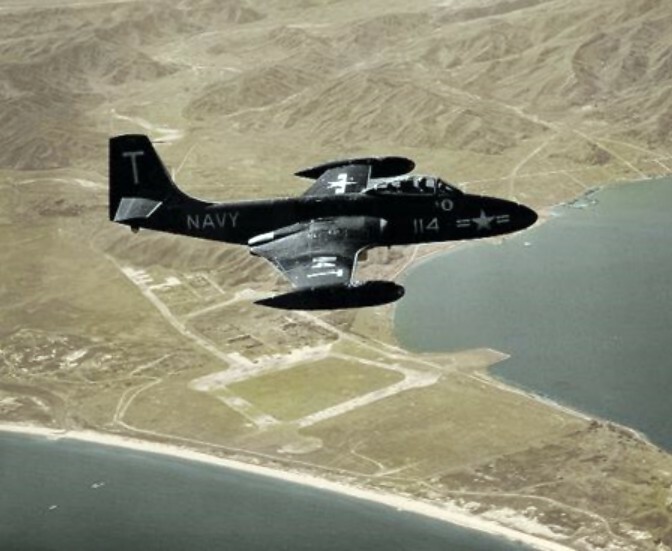 In 1959, he was assigned as Chief of Staff to the commanding officer of Readiness Air Wing Twelve (RCVW-12) at NAS Miramar, San Diego, California. It was while in this assignment that he set the World Altitude Record with the YF4H-1. On 1 July 1962, Flint was promoted to the rank of Captain and took command of RCVW-12. Captain Flint took command of USS Merrick (AKA-97), an Andromeda-class attack cargo transport, 16 July 1966. (A “deep-draft command,” that is command of a large naval ship, is generally considered a prerequisite to being selected for command of an aircraft carrier.) 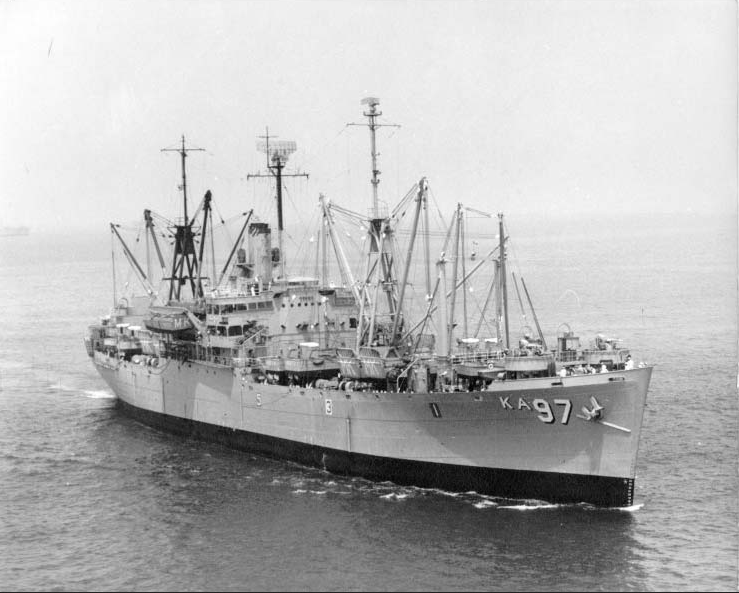 Merrick was operating in the western Pacific and Vietnam. Captain Flint remained in command until 13 May 1967. Captain Lawrence Earl Flint, Jr., retired from the United States Navy in March 1968. He and Mrs. Flint resided in La Jolla, a seaside community within the city of San Diego, California, until his death, 16 November 1993. She passed away 20 December 1996. ¹ FAI Record File Number 10352: 30,040 meters (98,557 feet), 6 December 1959; FAI Record File Number 9060: 2,585.425 kilometers per hour (1,606.509 miles per hour), 22 November 1961; and FAI Record File Number 8535: 20,252 meters (66,444 feet), 5 December 1961. 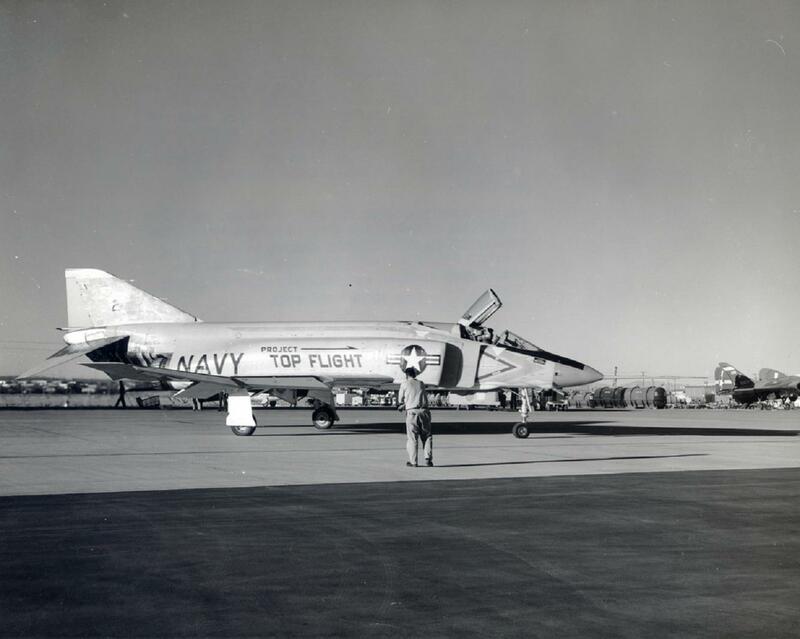 27 May 1958: At Lambert Field, St. Louis, Missouri, McDonnell Aircraft Corporation’s Chief Test Pilot (and future company president) Robert C. Little made the first flight of the YF4H-1 prototype. 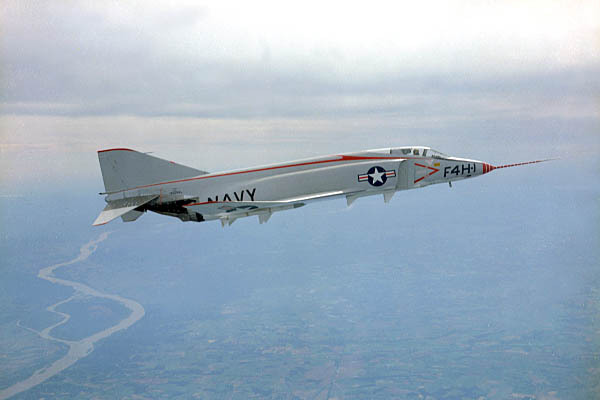 The twin-engine Mach 2+ airplane was the first pre-production model of a new U.S. Navy fleet defense interceptor that would be developed into the legendary F-4 Phantom II fighter bomber. The flight lasted 22 minutes. Little had planned to go supersonic but a leak in a pressurized hydraulic line caused him to leave the landing gear extended as a precaution, should the back-up hydraulic system also have a problem. This limited the maximum speed of the prototype to 370 knots (426 kilometers per hour). A post-flight inspection found foreign-object damage to the starboard engine. Initially designated XF4H-1 and assigned Bureau of Aeronautics serial number (“Bu. No.”) 142259, the identifier was changed to YF4H-1. It had been in development for over five years based on a company proposal to the Navy. 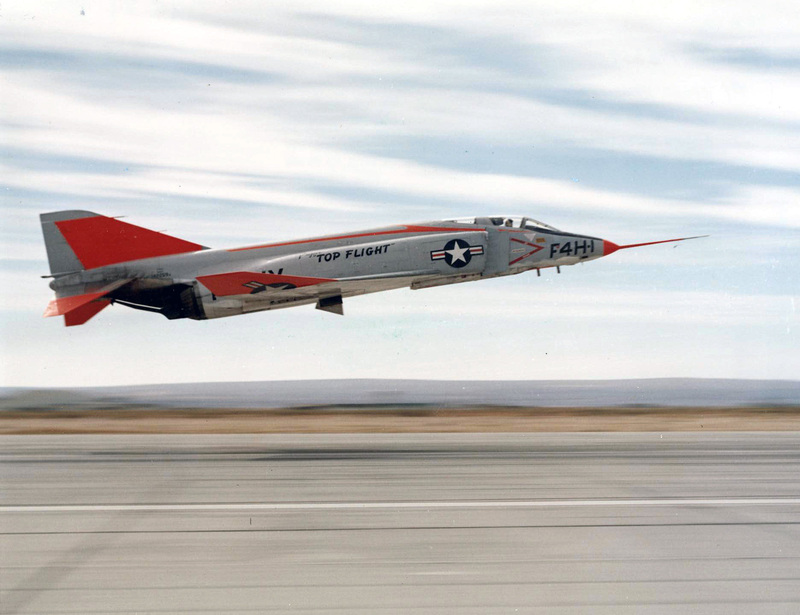 The McDonnell YF4H-1 Phantom II was 56 feet, 7.9 inches (17.271 meters) long with a wingspan of 38 feet, 4.89 inches (11.707 meters) and overall height of 16 feet, 3.0 inches (4.953 meters). With wings folded, the airplane’s span was narrowed to 27 feet, 6.6 inches (8.397 meters). The wings were swept 45°, measured at 25% chord. The inner wing had no dihedral, while the outer panels had 12° dihedral. The stabilator had a span of 16 feet, 5.0 inches (5.004 meters), with -23.25° anhedral. The wheelbase of Phantom II’s tricycle undercarriage was 23 feet, 3.25 inches (7.093 meters), with a main wheel tread of 17 feet, 10.46 inches (5.447 meters). The YF4H-1 prototype was powered by two General Electric J79-GE-2 engines. These were single-spool, axial-flow turbojet engines with a 17-stage compressor and 3-stage turbine. The J79-GE-2 was rated at 10,350 pounds of thrust (46.039 kilonewtons), and 16,150 pounds (71.389 kilonewtons) with afterburner. The engines were 17 feet, 4.0 inches (5.283 meters) long, 3 feet, 2.3 inches in diameter (0.973 meters), and each weighed 3,620 pounds (1,642 kilograms). The production F4H-1 (F-4B) had a maximum speed of 845 miles per hour (1,360 kilometers per hour) at Sea Level and 1,485 miles per hour (2,390 kilometers per hour) at 48,000 feet (14,630 meters meters). (Mach1.11 and Mach 2.25, respectively). The service ceiling was 62,000 feet (18,898 meters) and maximum range with external fuel was 2,300 miles (3,700 kilometers). McDonnell Aircraft Corporation prototype YF4H-1 Phantom II Bu. No. 142259. The F-4A through F-4D Phantoms were armed with four AIM-7 Sparrow radar-homing air-to-air missiles, and could carry additional Sparrows or AIM-9 Sidewinder infrared-homing missiles on pylons under the wings. Up to 16,000 pounds (7,257 kilograms) of bombs could be carried on five hardpoints. 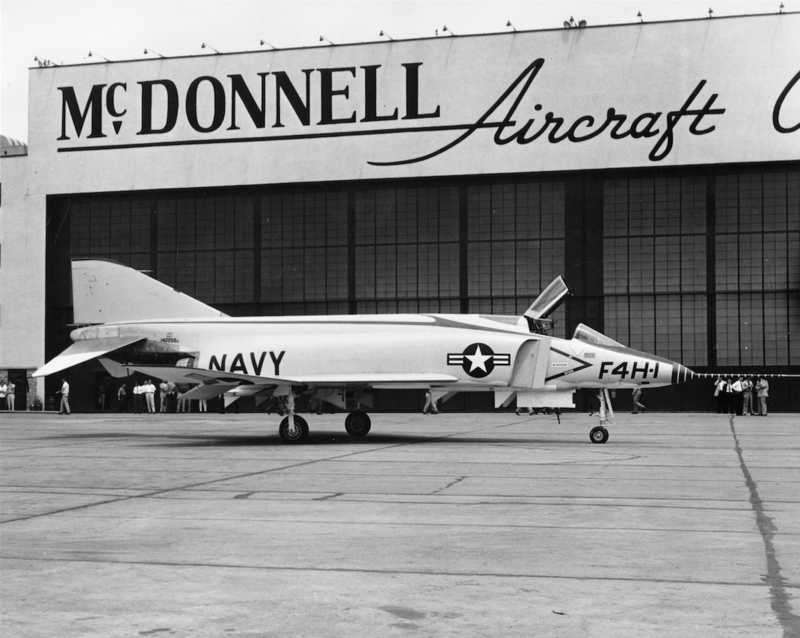 McDonnell Aircraft built two YF4H-1 prototypes, followed by 45 F4H-1F (F-4A) Phantom IIs before the F-4B was introduced in 1961. 649 F-4Bs were produced. 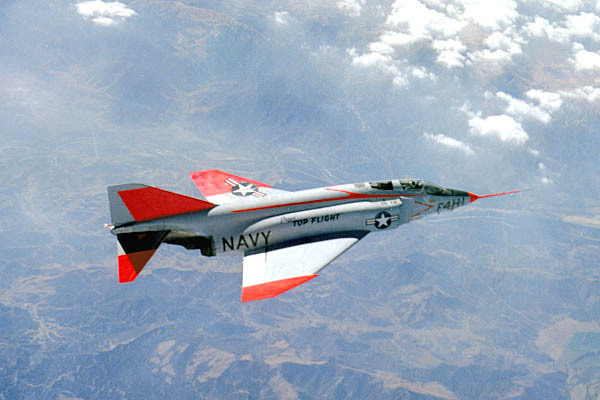 The initial U.S. Air Force variant was the F-110A Spectre (F-4C Phantom II). 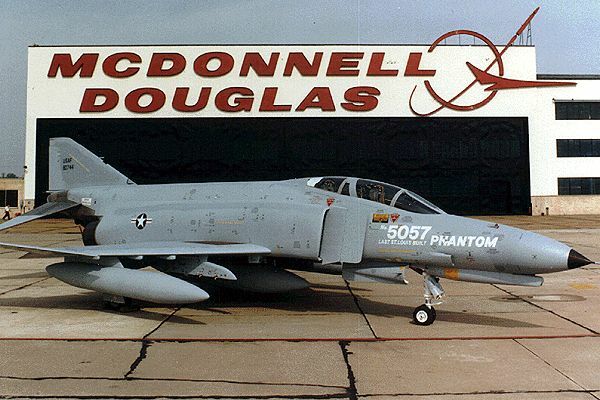 McDonnell Douglas delivered its last Phantom II, an F-4E-67-MC, on 25 October 1979. In 21 years, the company had built 5,057 Phantom IIs. 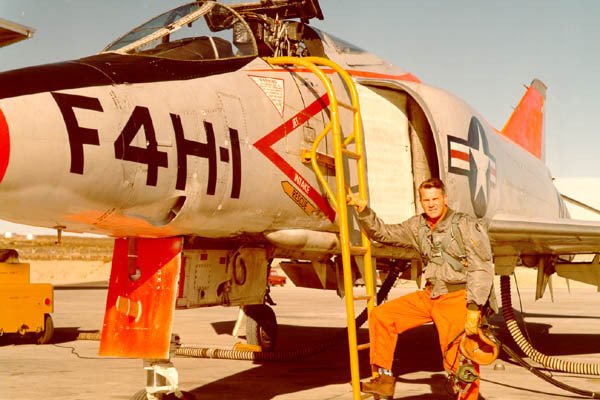 After 11 test flights at St. Louis, Bob Little flew the YF4H-1 west to Edwards Air Force Base in California where more detailed flight testing and evaluation took place. On 21 October 1959, a failure of an engine access door led to a cascading series of problems which resulted in the loss of the airplane and death of the pilot, Gerald “Zeke” Huelsbeck.